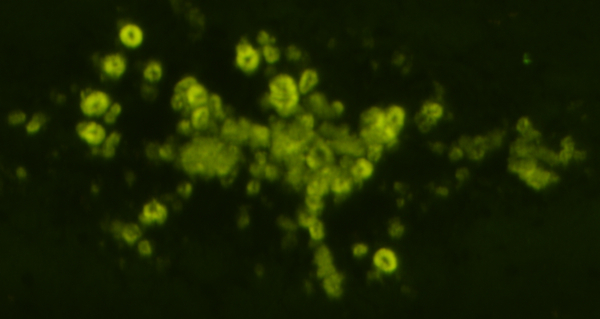 Diagnostic probes glow yellow when bound to amyloid associated with prion infection. Sticky plaques of proteins called amyloids mark several different, though related degenerative brain diseases including Alzheimer’s, Parkinson’s and Creutzfeld-Jacobs. The symptoms of these disorders overlap and methods to diagnose and monitor them are not very advanced. To solve this problem, scientists at the University of California, San Diego, have devised several new fluorescent probes that change color depending on what type of amyloid they encounter. Because amyloids accumulate in the eye as well as the brain, their discovery offers hope that one day neurodegenerative diseases could be differentially diagnosed with simple eye drops or ointment and an eye exam. “The key trick here is that the small differences in the proteins that make up different forms of amyloid interact differently with our fluorescent probes to result in measurably different colors of the emitted light,” said Jerry Yang who, along with Emmanuel Theodorakis, led the project. Both are professors of chemistry and biochemistry at UC San Diego. Christina Sigurdson from the Department of Pathology at UC San Diego’s School of Medicine was a key collaborator in this work. The same probe glows green when bound to amyloid associated with Alzheimer’s disease. The colors vary depending on the physical properties of pockets in the different amyloid proteins. 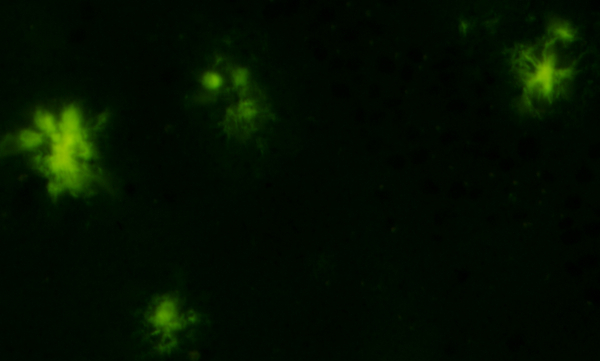 The team demonstrated that one of their probes glows yellow when marking amyloid deposits associated with prion disease, and green when it binds to amyloids associated with Alzheimer’s disease in tissue samples, for example. Their findings are published online this week by the Journal of the American Chemical Society. Among the few available diagnostics for Alzheimer’s disease are radioactive molecules that target amyloid, which can be detected in the brain using positron emission tomography or PET scans. But that test only says whether amyloid has formed in the brain without distinguishing between the various types. Now that they have learned how physical properties of amyloid control the colors of their markers, they are expanding their catalog to create probes for discriminating between other forms of amyloid. The technology has been licensed for commercial development of diagnostic tests for human neural disease. Co-authors include Kevin Cao, Marianna Dakanali and Willy Chang in the department of chemistry and biochemistry, and Mona Farahi in UC San Diego School of Medicine’s Department of Pathology. The National Science Foundation (CHE-9709183, CHE-0741968, and CHE-0847530) and the National Institutes of Health (CA 133002 and R01NS069566) supported this work.